I am a mobile disco with years of experience, I play all sorts of music from 50s to present day and I cater for all the clients needs. My policy is whatever you want I try my hardest to provide. It's your party so I aim to please you. Required by many venues, Kingsdiscos has a current PLI policy with Mobile DJ Network in the amount of £10 million. Also required by many venues, Kingsdiscos has not provided satisfactory evidence of having current PAT records available. A Method Statement, outlining Kingsdiscos&apos; Health & Safety procedure for setting up disco equipment has not been supplied. Why do people choose to book Kingsdiscos? "First class service very friendly proffessional and everybody enjoyed the music would use Stuart agian "
"I booked Stuart for a small family party for my dad's 80th birthday. Even though there wasn't many of us, everybody got up dancing and had a fantastic time. I would recommend Stuart to my friends and family and would definitely book him if I needed a DJ for a future event. " "The DJ was excellent, set up, played the music we asked plus music of his choice of the same genres as ours and was genuinely superb. Recommended to all!!" "Thank you, your comments are really appreciated"
"Would defiantly use Stuart again. Can’t fault him! " "Nice little venue and a wonderful couple. Had a great time." "Booked Stuart for my mothers 60th. Stuart was on time set up with no fuss and it looked great. He played all the songs we asked for and also played requests from everyone all night. Very friendly and easy to work with, before party emailed Stuart on many occasions and he always reply very quick and had no problems with my requests for the night. everyone was up dancing and all enjoyed themselfs. Would highly recommend Stuart, and any party I have in the future I will book again." "Lovely feedback thank you. As said by client it was a great party and lovely people too." "Stuart was amazing, got there early, set up his equipment with no fuss and it all looked really good. The lights and music were great and I would highly recommend him. " "Great party, lovely people. Thank you for the booking"
"I would definitely use Stuart again and everyone said how good he was, we were dancing all night , my daughter had a wonderful time "
"Lovely family and great music choices. Very enjoyable night. This sort of party is why I love being a DJ." "Good DJ and a top bloke! Goes above and beyond what is required! Thoroughly recommended!!!" "Thanks for the great comment. Lovely venue and wonderful people." "Excellent DJ. Stuart did a great job and would definitely recommend to others. Great value. Thanks." "Stuart player what we wanted, great value - no fuss! Will be booking him again next year!" "Very nice venue and amazing people, we all enjoyed the night very much." "Great, Booking again for next year! Great selection of music to suit everyone." "Excellent contact to meet and a pleasure to provide the music for her New Years Eve party. I am more than happy to repeat the event again this year." "Stuart King was very professional, he asked the right questions regarding the choice of music. He arrived with plenty of time to set up and just got on with it, there were no noise problems with his system at all and the lighting was great. He reacted perfectly with regard to requests and announcements for a surprise birthday party. I found him very reasonable price wise. I would have no hesitation in recommending Stuart to family and friends." "Great night, lovely people, enjoyed the evening." "Stuart was great he had all the music at hand that could possibly be requested as discussed before the event. He was on time to get started at the time required and put on music to suit everyone. Everyone had a great night and I would definitely recommend Stuart." "The clients were a lovely family to meet, we had a great evening together." 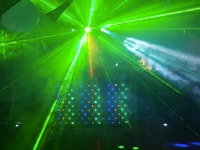 Kingsdiscos also offers a range of additional party services not directly linked to musical entertainment. If you are contacting Kingsdiscos about an event, it's always a good idea to include the DATE, LOCATION, EVENT TYPE, AGE GROUP and TIMINGS to speed things up!